The Hunger Games is in many respects a series that deserves acknowledgment for how it stands out within its Young Adult genre. The themes handled are mature in comparison to those of its kin—even when the execution isn’t consistent as such. Such themes are present in the second installment of the Hunger Games trilogy: Catching Fire—where we get to see the consequences of Katniss and Peeta’s survival at the conclusion of the last film’s games. Consequences which have set their world on the verge of a revolutionary rebellion—a rebellion that can either be sparked or pacified seemingly only by Katniss. But as we delve into the film, we learn, as Katniss does, that there are larger puppeteers at hand. After attempting double-suicide during last year’s Hunger Games, Katniss Everdeen (Jennifer Lawrence) and Peeta Mellark (Josh Hutcherson) have become icons all throughout the nation of Panem. To the Capitol, their act was one of love—but to the oppressed districts, it has been interpreted as one of rebellion. One that has incensed many into following suit—much to the chagrin of President Snow (Donald Sutherland), who is determined to squash the rising revolts by subverting the symbol that Katniss has become. With the aid of new head Gamemaker, Plutarch Heavensbee (Philip Seymour Hoffman), a plot is concocted to make an example of Katniss: victors are reaped from all twelve districts and thrown back into the arena for the 75th Hunger Games anniversary—the “Quarter Quell”. This includes our heroes, as well as some new faces played by Jena Malone, and Sam Claflin. 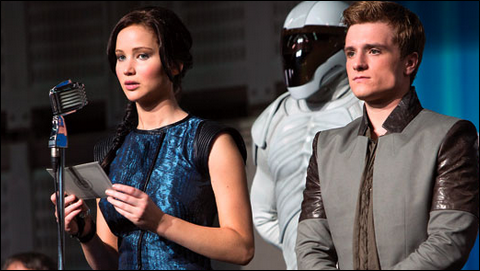 However, as President Snow tells Katniss, the Games are just that. Games. That is, in comparison to the potential war that could destroy everything she holds dear. And unfortunately, due to this, there’s a sense of levity here that leaves us feeling underwhelmed. Catching Fire is a more mature tale than its predecessor. There’s more focus on the politics and themes of characters’ actions this time around—even though they are handled with the subtlety one could expect from a film with a target demographic of adolescents. Nonetheless, there’s some quality material tossed about here. However, it’s a lot of build up with little pay off. At least thus far. Emphasis is placed on the fact that the stakes have profoundly increased since the last movie, and the film dedicates a large amount of time establishing this. So much so that by the time the characters finally reached the arena, I felt a drained, and ultimately, apathetic. In the broad scope of things, the game doesn’t mean much anymore. The film realizes this too, as despite the cinematography being skips and bounds above the first movie’s, the brutality from the last games is missing. Time is spent hyping up the fact that the Quarter Quell’s participants are composed of veterans, but the intensity doesn’t meet that of The Hunger Games’.